President Obama hit back at critics who say the U.S. not doing enough for Honduras following a trilateral meeting with President Calderon of Mexico and Prime Minister Harper of Canada in Mexico today. Mr. Obama said those complaining that America has not done enough following the military coup that resulted in the overthrow of the government of President Manuel Zelaya on June 28 "can't have it both ways." "The same critics who say that the United States has not intervened enough in Honduras are the same people who say that we're always intervening and the Yankees need to get out of Latin America," said Mr. Obama. The president said the U.S. has done everything it could, including condemning the coup and calling for an immediate reinstating of President Zelaya. "If these critics think that it's appropriate for us to suddenly act in ways that in every other context they consider inappropriate, then I think what that indicates is that maybe there's some hypocrisy involved in their -- their approach to U.S.-Latin American relations," said Mr. Obama. Canadian Prime Minster Stephen Harper supported the statements made by Mr. Obama, suggesting that "If I were an American, I would be really fed up with this kind of hypocrisy." 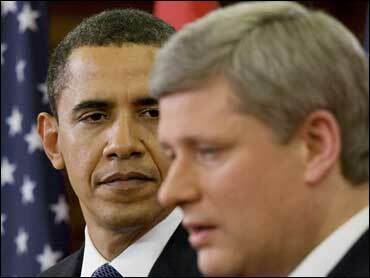 "You know, the United States is accused of meddling except when it's accused of not meddling," Harper said. He went on to say that the latest criticism of the U.S. not doing enough in Honduras comes from the very same people who would condemn longstanding cooperation between Colombia and U.S. for "legitimate security and drug trafficking reasons."